The FDA has identified one farm that grew some of the romaine lettuce linked to an E. coli O157:H7 HUS outbreak that has sickened almost 100 people in 22 states. That facility is Harrison Farms of Yuma, Arizona. Lettuce grown there sickened inmates at the Anvil Mountain Correctional Center in Nome, Alaska. The FDA notice also states that they have “not determined where in the supply chain the contamination occurred.” In other words, the lettuce could have been contaminated in the field, during harvest or processing, during packaging, or during shipping. The lettuce in question harvested from Harrison Farms was picked March 5 – 16, 2018 and is past its 21-day shelf life. And the growing season in the Yuma region has ended, so the farm is not growing any lettuce now. 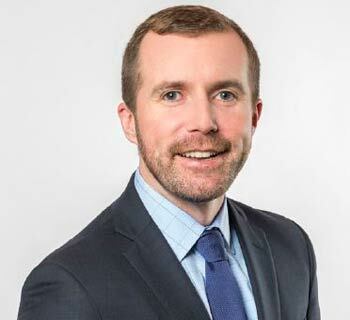 You Brendan Flaherty, an attorney with Pritzker Hageman, said, “We hope that the FDA can identify the growers and distributors of this product that has seriously injured so many people.” Brendan is representing several patents in this outbreak, including some with HUS. You can contact Brendan for help at 1-888-377-8900. 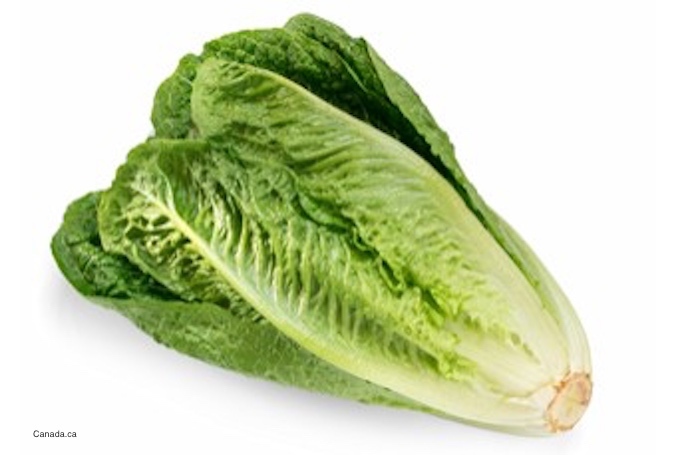 Authorities have not figured out where the romaine lettuce that sickened the rest of those in this E. coli O157:H7 HUS outbreak came from. Most people said they ate a salad at a restaurant. Those restaurants told authorities they used bagged, chopped romaine to make salads. That romaine did not come from Harrison Farms. This E. coli O157:H7 HUS outbreak has sickened 98 people in 22 states. The case count is: Alaska (8), Arizona (5), California (16), Colorado (2), Connecticut (2), Georgia (1), Idaho (10), Illinois (1), Louisiana (1), Michigan (3), Mississippi (1), Missouri (1), Montana (8), New Jersey (7), New York (2), Ohio (3), Pennsylvania (18), South Dakota (1), Tennessee (1), Virginia (1), Washington (5), and Wisconsin (1). The patient age range is from 1 to 88 years. To conduct traceback, public health officials identify illness clusters, and trace the food those people ate to a common source. The problem is that there is limited packaging information on these types of products. The FDA knows that the lettuce came from the Yuma, Arizona region, but they do not know which specific farm grew it, who processed and shipped it, and who distributed it. If you have any romaine lettuce and you cannot confirm where the product was grown, throw it away. Then sanitize your refrigerator with a mild bleach solution, and clean your cutting boards and countertops to kill any bacteria. Clean your hands with soap and water after handling these products and after cleaning. The symptoms of an E. coli O157:H7 infection include watery and bloody diarrhea, and severe and painful stomach and abdominal cramps. About 10% of patients who contract this infection develop hemolytic uremic syndrome, or HUS, which is a kind of kidney failure. Symptoms of HUS include decreased frequency of urination, small bruises, pallor, and feeling very tired. Anyone with these symptoms should see a doctor immediately. 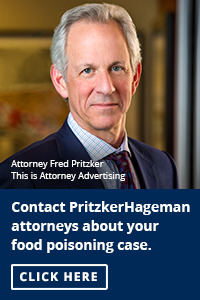 Pritzker Hageman, America’s food safety law firm, successfully represents people harmed by adulterated food products in lawsuits throughout the United States. 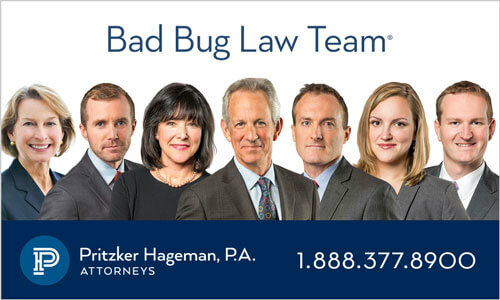 Its lawyers have won hundreds of millions of dollars for survivors of foodborne illness, including some of the largest verdicts and settlements in American history. The firm’s recent trial victory on behalf of a child with E. coli poisoning and hemolytic uremic syndrome is the biggest recovery of its kind.